If your Mac desktop is cluttered with multiple open windows, then you need a good way to quickly close them all without clicking every red x button one by one. Let’s briefly review your different options. Unfortunately, there’s no shortcut that will close all open windows at once, but you can close all of a given app’s open windows at once, making quick work of your cluttered desktop. The most obvious option is quitting the application. If you press Command+Q to quit an app, all of its windows will close. This method has its flaws, however. Quitting doesn’t work with Finder unless you apply a Terminal hack, and you may not always want to quit an app entirely—you might want it to continue to run in the background, like if you want Mail to continue to check for new items, or iTunes to play your jams. Command+W, on the other hand, will close the frontmost window. You could press Command+W repeatedly to close a bunch of open windows, but that’s still not as quick as it could be. Plus, if you have application and Finder windows spread about your various desktops, then you need to go around finding them and closing each one. The best option, in our opinion, comes in the form of the wonderful Option key. 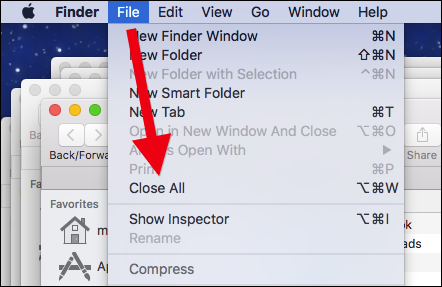 To close all of an app’s windows in one fell swoop, just press Command+Option+W, or open the “File” menu and hold the “Option” key to see the Close All command. More of a mouse user? There’s another secret power the Option key will unveil. Hold it and click the red button in the upper-left corner of a window, and it will close all that app’s windows just like Command+Option+W. It’s that simple. Now you can stamp out your open window problem with a simple keyboard shortcut or a mouse click, courtesy of the Option key.